Perennial herb. Leaves alternate, compound, 2 or 3-pinnate, typically glabrous beneath. Flowers are white on stout pedicels. Fruits usually white with a dark spot in the middle, with the pedicels often turning pinkish as maturity. The white fruits with black centers give this plant the common name of "doll's eyes". Note the thick flowering stalks (pedicels) that are also evident when the plant is in fruit. 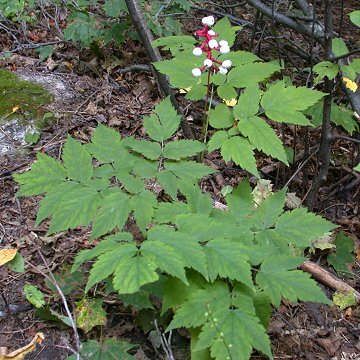 It is called baneberry because the berries are toxic to humans, as is the foliage. See A. rubra for an idea of what the flowers would look like and note the difference in the thickness of pedicels (stalk supporting the flowers/fruit). While the fruit is usually white it can occasionally be red. The last two images show a plant with red fruit and pedicels. USDA, NRCS. 2002. The PLANTS Database, Version 3.5 (http://plants.usda.gov).